Early in December, Hubs went away on a business trip for eleven days, leaving this creative night owl with credit card to her own devices. What did he find when he returned home? Christmas exploded up in here, yo! So I might have gotten a little carried away with the decorating this year. (*sheepish*) Mrs. Claus kept quite busy while Santa was away, after our little elf went to bed at night. Again, I blame Pinterest. Here’s what I’ve been up to in the wee hours of the morning when I should’ve been sleeping. I really wanted to do something nice with our mantle, and I got all inspired by this pin. 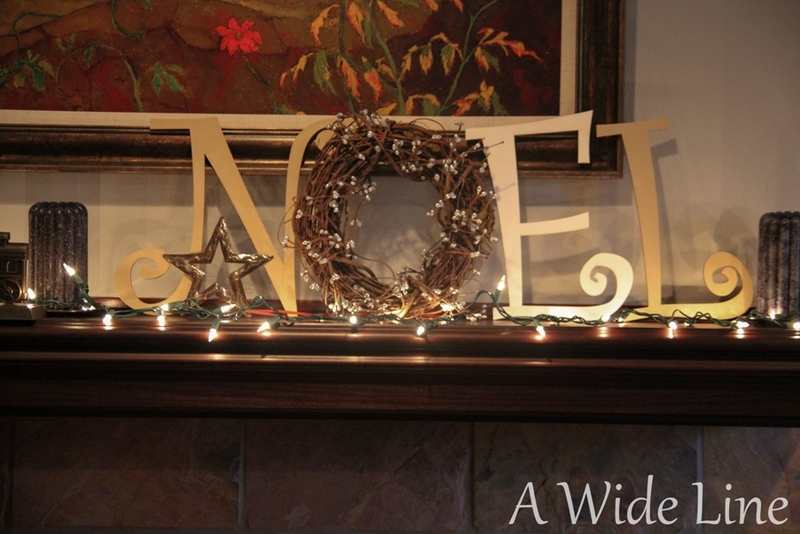 So I ordered my own wooden letters to spell out “NOEl.” I used a brown wreath for the “O” and wrapped it silver berry garland. The company I ordered the wooden letters from allowed to choose the font, height and thickness of the letters – totally customizable and inexpensive. I chose the font called “Curlz” because it reminds me of elf shoes. 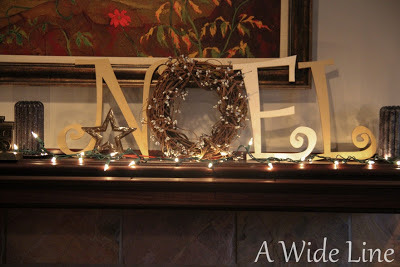 (Oooh, I should see if I can find some little elf decorations for next year…) I painted the letters myself, two of them a sandy beige and one white, and added a pearlescent to the paint for just a hint of holiday shimmer. I think my Heart of Haiti star adds a nice touch. 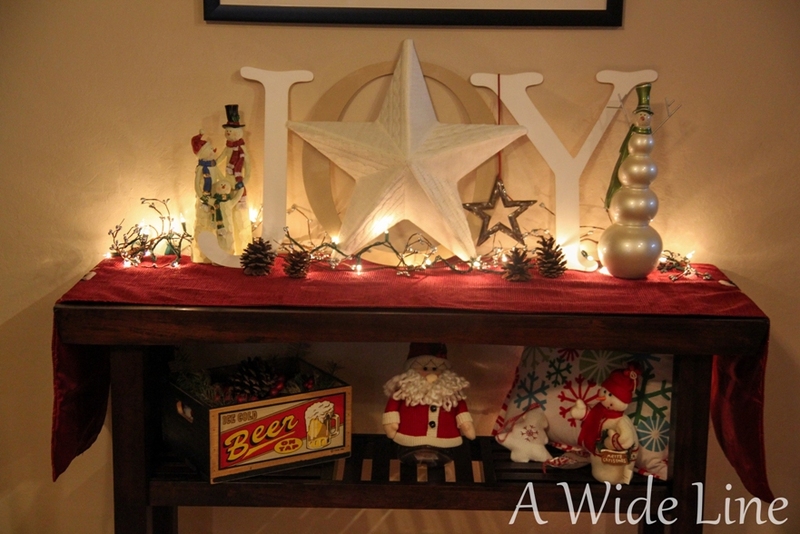 I had so much fun painting, I decided to carry the theme over to our side table near the entryway. 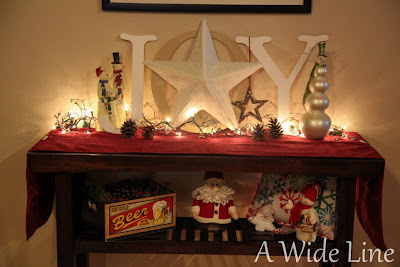 Here, I chose the word “JOY” and placed this awesome white star I found at Target in front of the “O.” It’s covered in white cable-knit, almost like a sweater. Love it. And my second Heart of Haiti star looks nice hanging from the “Y.” I placed several toddler-friendly decorations on the bottom shelf of the side table to deter Quinn from touching the items on top, and so far it’s working. 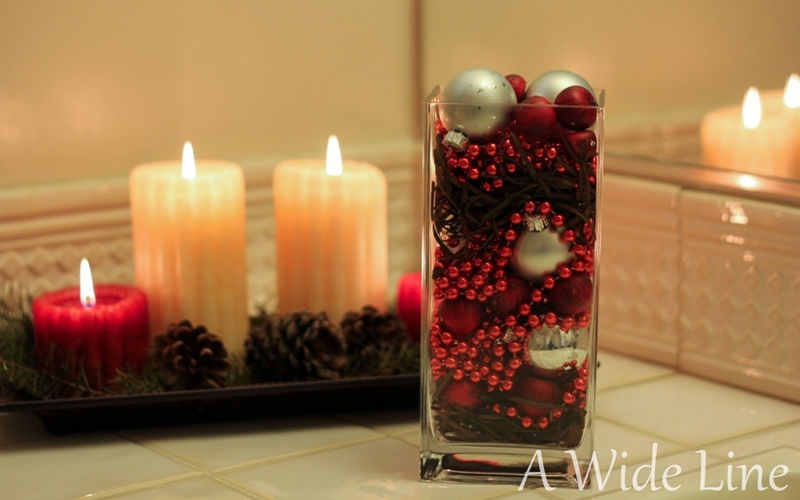 After filling these hurricane vases with dried lentils for Fall, I decided to refill them with Christmas items. I had some leftover fake spider webs from Halloween, and that made excellent snow. For the other layers, I bought shredded brown package stuffing (the kind that almost feels like wood shavings), some tiny silver pinecones, and red beaded garland strings. (Thank you, Michaels.) I took a few of the small red balls off of the string and added some leftover trimmings from our Christmas tree, and I shoved it all in around a red candle. If you want to go the lentil route again for Christmas, you can use dried cranberries, peas and rice. The options for this one are endless. Here’s a really easy one. Not sure what to do with all those old teeny tiny ornaments from the old teeny tiny Christmas tree in your old teeny tiny apartment? 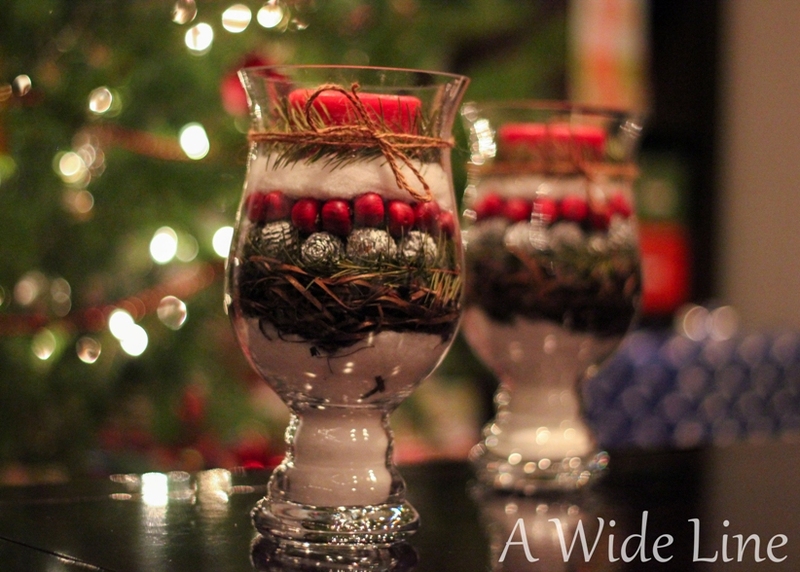 Throw ‘em into an unused vase along with some other Christmas odds and ends and voilá! Now your guest bathroom is all kinds of festive. I also got all the presents wrapped while Hubs was gone. My mom taught me to put the bows near the top of the box or in the corner so that you can overlap them under the tree without squishing the bows. Plus, it makes all the gifts spill out into the room, making it look like there’s a lot more there, and it really adds to the anticipation of Christmas for the kids (and maybe for certain adults, too). Hubs didn’t freak out at all when he got home. In fact, he commented on how nice everything looked and seems to really like it. I think he’s just happy to home with his family, and we’re happy to have him back in time for Christmas. 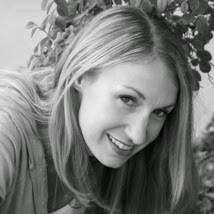 nice work, melissa! i especially love the parfait look in the glasses. i always admire those when i see them done well and think i should make them, but i don't decorate, really, so it never happens. i'll just admire yours. pretty! Thanks so much! You're so sweet. I'm searching Pinterest to find a wintery look for the vases that's not Christmas-y until Spring arrives. Happy New Year!! Looks beautiful! I can't believe you have all of your presents wrapped already!!! Thanks, Kimberly! Hope you had a wonderful Christmas!